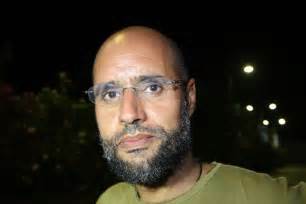 Saif Al-Islam, son of Mummar Gaddafi has vowed to drag Qatar before the International Criminal Court (ICC) for the role the tiny rich Gulf country played in the overthrow of his father’s regime in 2011, lawyer of the Gaddafi family has told media. Khalid Al-Zaidi said his client is also preparing his political comeback, adding that Libyans still support him. Saif was freed in July after being held in Zintan. He was granted amnesty by the east-based parliament of Tobruk. Head of the UN Special Mission in Libya last month said all Libyans including Saif are allowed to take part in the new political plan of action with presidential and general elections as climax next year. Zaidi noted that Saif will soon erect an international organization to sue Qatari senior officials, including former Emir Hamad bin Khalifa Al-Thani, before the ICC. Doha leagued with NATO to ouster Gaddafi in the 2011 revolution, which has left the country with no central administration. Saif himself is wanted by the ICC for war crimes committed during the uprising. A decision to hand over Hamad bin Khalifa Al-Thani has to be made by the UN Security Council. Qatar is not a signatory to the ICC protocol.